Is there anything more exhilarating than a good game of Canadian football? Needless to say, we didn’t hesitate when TSN asked us to participate at the 105th Grey Cup Fan Fest. Again, how could we say no to that?! This year, Ottawa hosted the Grey Cup at TD Place Stadium. The Toronto Argonauts took on the Calgary Stampeders in one of the most exciting, historic games of the season. (Spoiler alert: Calgary did not stampede Toronto this time!) We are still thawing out from the gameday snowfall. And, though it was a cold day in Ottawa, Canada’s Queen of Country Pop brought the heat during her incredible halftime performance. Football combined with Shania Twain makes for an amazing day if you ask us! What did we do for TSN? So, how did we help exactly? TSN asked us to participate in Fan Fest at the Nissan Fan Zone. We brought in our equipment, and set up an 180 degree photo booth for Grey Cup attendees to enjoy. Prior to kickoff, fans from all over came by our booth to create their own photo experience against a customized backdrop of TD Place Stadium. We would like to thank TSN for bringing us in to be a part of this exciting day! It was such a memorable experience, and we enjoyed every minute of it. 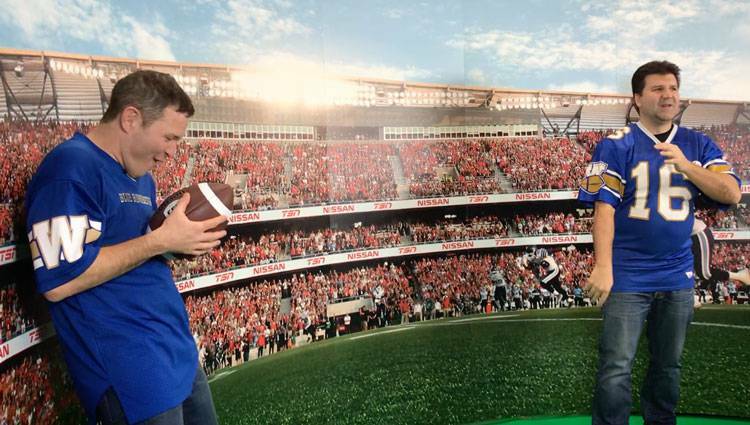 Also, thank you to all who stopped by our custom Grey Cup 180º photo booth! Please let us know if we can ever assist you or your company with our customized photo experience capabilities. Bringing the miniFreeze to Cricfest! Right on “Target” with Pixperience!